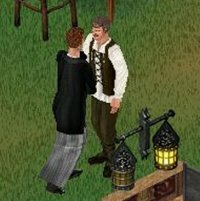 The Sims : Making Magic - A spectacular performance or a poor trick? Have you ever wanted to turn your next door neighbour or big brother into a toad? What about wanting to have a gnome do your gardening or a skeleton to to do your cleaning? If you'd like a change of pace, would you like to go for a ride on a ghostly rollercoaster? 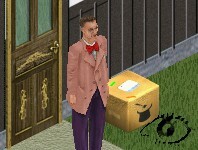 If the answer to any or all of these questions is a "Yes", then "Making Magic", the last expansion pack for the phenomenally successful series of what we call "The Sims" might be what you have been looking for. Personally, when I heard they were doing a series on magic, I cynically referred to it as "Harry Potter and The Seventh Expansion". 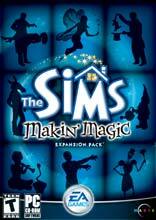 As there wasn't a patch to fix the errors in "The Sims: Superstar", I felt it a bit of a ripoff for us to have to buy "The Sims: Making Magic" if it wasn't a subject we were interested in if we only wanted to make our game work properly. So, in order to see whether I think MM is a memorable magical performance or a poor card trick, please read on. Installation is a case of the same old thing. Scandisking and defragging your HDD are recommended, but aren't they always? MM is a two disk set and takes up about 1Gb on your drive and about 20-30 minutes to install. It also comes with a third disk about TS2, which I found fascinating. However, TS2 is "coming soon". Back to MM. Once loaded up, the bright orange startup screen I had from "Superstar" is replaced by a dark blue one and the Awards Ceremony music replaced with music more reminiscent of a carnival organ or gypsy encampment. After the 4-5 minutes of loading up - probably more depending upon the amount of downloads you have - you end up in the familiar neighborhood screen with a new icon along the top bar for magic town. Although immediately wanting to make that trip to Magic Town, I instead took my usual look at how many new skins there are by creating a new family and went in to check out what was at home. There aren't that many new skins and I can't quite see hideous chrones and spooky old men following a celebrity career in Studio Town or getting the car pool every morning for a more mundane job ... although I'm sure at some time you feel your high school principal or supervisor at work might look like one of them. If you're looking for a Harry Potter lookalike, there isn't any better than the geeky kid who has been there since the original game was released. Mind you, one of the older men does look vaguely like Professor Dumbledor. 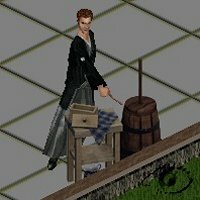 There are a few skins that I have only seen before in TSO that have finally made the transition to TS, but there are more from TSO that I would have liked to see, skins that I feel would have been suitable for your wannabe mages. There are quite a lot of new walls and floors, columns and foliage. Whereas the ones that came with "Superstar" were bright and vibrant and made you think "celebrity party", these ones are in the main quite dark and dismal and make you think "witch's coven". There are the usual additions to seating and surfaces, there are new dishwashers and trash compactors but the main addition is in items for cooking and making magic, which is not surprising considering the name of the expansion. Ingredients and preparation are an important part of spells but more of those later. 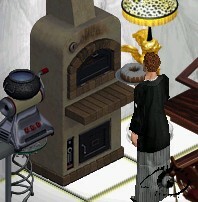 You can now bake if you have the right ingredients and there is a special oven that allows you to. Your life as a wizard or witch starts off at home when the Mystery Man appears and drops off a box of goodies from Magic Town, which include a wand, a spell book, some ingredients for a spell, some magic coins and a hole in the ground. 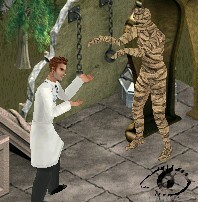 In order to do magic, you need a wand and if there is more than one person in the family who wants to be a mage, you will have to go to Magic Town to get another from the Mystery Man for Â§50. What's that? How do you get to Magic Town? You could go the "Alice in Wonderland" way ... through a hole in the ground although there is no white rabbit who is late for an appointment. Otherwise, you could look in your Yellow Pages and then call Balloon Tours to take you to Magic Town, but they cost Â§50. 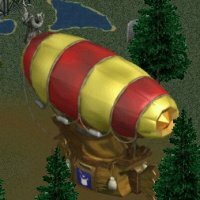 The hole is cheaper but if there is more than one in your party, hiring the Balloon is the only way to get all of you there. There are 9 different lots ... but unlike the other venues you can order a taxi to take you to, some of them are not automatically accessible. 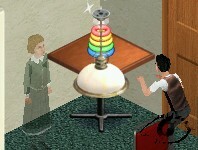 Three of them are also residential and as well as being paid for with simoleons need to be paid with MagiCoins. The other six can be visited and include magic venues, amusement parks, recreation areas and shops. Recreation areas and shops are nothing new, just the type of goods for sale. We've seen them before from Hot Date, Vacation, Unleashed & Superstar. This time, however, you can also barter with various of the vendors. If you have a certain commodity, they will give you something else in return. Amusement parks are new, though. Crazy golf was a thought for "Vacation" but never saw the proper light of day until now ... and the wait has been worth it. Four different holes are available to set up your own courses. 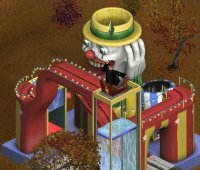 The most flexible idea is now rollercoasters that you can build with a combination of features from a haunted house or funhouse themes. They turn and twist with various set pieces along the way, guaranteed to improve your fun or give you the fright of your life. Going to Magic Town is a necessity rather than an option if you take your magic seriously. Spells and charms require certain ingredients, some of which you can't grow or make at home. Some ingredients you can redeem with MagiCoins and others you can only get from bartering. 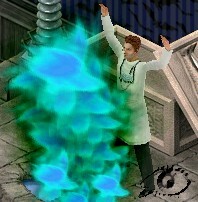 MagiCoins are the currency of Magic Town and apart from the initial donation you get, you have to earn them and the most effective way is to perform magic, which is logical and actually the skill you need to do a quality performance of the kind you see Liam, my first wizard, demonstrating. To find out what ingredients you need for a spell or a charm or a recipe, you need to look in your magic book or the family cookery book. Although the cookery book tells you what it makes, it does not tell you the effects. The spell book doesn't even tell you what the spell or charm does until you have put in the right ingredients for one of them. Spells and charms vary in effect ... and sometimes backfire. 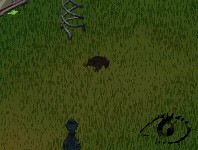 As well as turning someone into a toad or animating a gnome to do the gardening, you can cast spells to make friends, make people happy, spells that get people to think the same way as you and a charm that will even turn you into a hideous monster. I am still working my way through it all so I can't tell you everything. What I can tell you is that the results can be amusing and in some cases, a real puzzle to find the right ingredients for some of them. 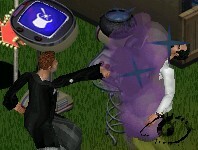 Spells can serve as a marvellous nice way to get your own back on someone who has offended you. Such a shame Liam didn't have his dragon when he cast this spell as they like to eat toads. What? 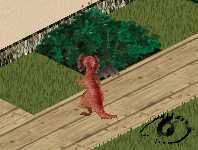 Didn't I tell you that you can have a dragon as a pet? If you want a change from having a cute puppy or kitten, Magic Town give you a quirky alternative in the form of a dragon. For 44 MagiCoins, you can buy a Dragon Nest, which comes in the form of a cradle and a green egg. Supposedly, the egg had a 2-3 day incubation period and how you treat the egg depends on what kind of dragon you hatch. My egg hatched almost immediately. If you are expecting a firebreathing monster in the like of Smaug from LOTR, you will be disappointed. If anything, when the egg hatches you can expect to see a cute little dragon that does not look dissimilar to Idris from "Ivor the Engine" or one from another children's TV series. My first and so far only time, from this green egg came a little red dragon called Burnie who skipped around, hovers a bit, and then carries on skipping around. "I'm Tarragon the Dragon. I'm very rarely here as every time when I'm about things seem to disappear"
This quaint little song from "The Herbs" describes exactly what your new fiery friend can do. If you don't pamper him with love and attention, he can become quite destructive. Your flowerbeds serve as food and it takes a delight in setting things alight. From personal experience, Liam came home from work one day to find his lovebed had been torched and all the periodicals the papergirl had delivered were in flames. 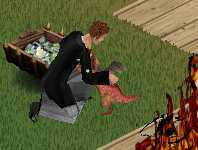 To appease your fiery pet, you can buy him dragon treats and chew toys, only available of course in Magic Town. You are not likely to find a pet store in Old Town that will be able to provide you with your unusual needs. Your dragon likes being groomed and tickled and if you are lucky, you can get some Dragon Scales or Dragon Tears for this, both of which are important ingredients for certain spells. Yes, you can be like Harry Potter or any of his contemporaries. Children have some unique magic items and their own grimoire of spells. To get a wand, you need the MagiCo NeoMagical Newt. The newt also doubles up as a wand charger and charm maker. Finding ingredients for their spells is not as complicated an affair as for adults as there are only three pages of charms and spells instead of six for adults. I have found the children's spells and charms to be quite quaint. For instance, my Harry Potter lookalike has been followed around for a day by an Invisible Friend who only he can interact with. This is very interesting diversion from the usual reality-based gameplay that we have been used to with "The Sims" ... but apart from that and this expansion being the bugfix we need for "Superstar", I can't see these magical gimmicks extending the gameplay life significantly, nor can I see the lifestyle being suitable for every sim or every player for that matter. In the same way the "Superstar" lifestyle would not for every sim, nor will the lifestyle of "Making Magic". Once I have found out what all spells and charms and recipes do, housetrained my dragon and thereby not need to place a fire alarm in every room, I see myself playing the more regular career paths again. For the completist in me, I am glad I have the set. From the players starting out and looking to spend some unspent Christmas money on an expansion pack, I would recommend other expansion packs before this one. For those who want to be Harry Potter or Willow or a latterday Gandalf or Merlin, it is interesting indeed and quite a laugh seeing a spell result for the first time. 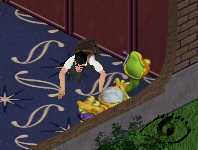 However, with constant play, I can see the interest going and people looking forward to the release of "The Sims 2". Written at 05:13 on Saturday 10 January 2004 by Andy.